The Real Strength Now Program was designed for people in their 50s, 60s, and above, though the importance of developing a preventive health & fitness routine at any age cannot be understated. Real Strength Now is a method of exercise that evolved from a lifetime study of martial arts, yoga, Pilates, and weight training. It is the distillation of theses multiple disciplines to find the one common denominator, the absolute key to health. WordPress website geared to lead generation, registration for exclusive members-only content, and the sales of several types of digital learning products and merchandise. Custom MailChimp Automation sequences to deliver welcome packages to Real Strength Now members. Richard La Plante‘s lifelong study of strength training began with a fall from a tree, when, at ten years old, he suffered a hangman’s fracture, more commonly known as a broken neck. His rehabilitation included twice weekly workouts in the school gymnasium using a barbell and a set of dumbbells. This was his introduction to progressive resistance exercise and the beginning of a journey that has taken him from weight training to yoga, from Pilates to an eighteen-year sojourn with the Japanese Karate Association and into one of the most renowned boxing gyms in Europe. He has learned from and trained with masters. For the past twenty years, he has given back his knowledge of strength and functional fitness to men and women of all ages, from athletes to doctors. His gym is devoted to the practice of health and wellness, and Real Strength, The Lost Art of Breathing chronicles his elective journey back to the basic substance of life, breath. 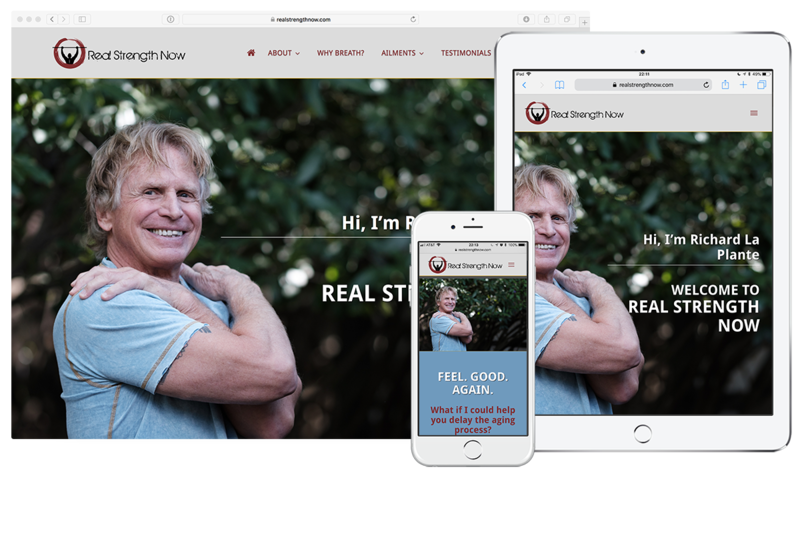 Hosting: RealStrengthNow.com is hosted on WPEngine Manage WordPress Hosting, which we feel is just about the best thing out there right now for secure and reliable WordPress hosting. ConvertPlug: Lead Generation made fun and easy. RestrictContent Pro: Restricts exclusive content only to members. Integrates natively with WooCommerce. WooCommerce for merchandise and non-member product sales. MailChimp Automation: Welcome packets delivered to the right people at the right time and intelligent list management based on user behaviors and active triggers.